When we think of the industrial-chic style we conjure up stripped back New York loft apartments, huge warehouse style spaces, and old disused factories. However, it’s all very well knowing what the industrial style is but how do you incorporate all the above when it comes to applying this look in your venue? It’s not that hard actually. You don’t need to live on the top floor of an old urban concrete site that has an old service lift for entering. The industrial-chic style simply gets its inspiration from these old factories and warehouses. It concentrates on exposed pipes and brickwork, reclaimed wood, concrete and ceiling beams. Industrial chic plays homage to the industrial revolution and involves mixing materials such as glass, reclaimed wood and metals to create a simple style. Described as no-nonsense and masculine, it is gaining popularly due to its ‘green’ credentials of repurposing old materials. You should be thinking of using muted tones that reflect the aged nature of what materials you are using. So for instance, natural creams, charcoal greys, or metallic tones of silver or gold also work well. Earthy shades such as browns, beiges, terracotta and brick colours are perfect for accents. Once you have decided on your colour palette you can then think about materials and textiles. METALS – Metals such as steel, chrome, galvanised metals or rusty and corrugated are the major players in the industrial chic style. They can be used within the furniture, as ornamental touches or serve a practical purpose. WOOD – Reclaimed, driftwood, work that has been roughened by the weather or overuse fits perfectly with this style. It can be anything from using an old farmhouse door for a kitchen table, or using railway sidings for shelves and beams. BRICK – Exposed brickwork just screams industrial chic and is a frim staple of this décor look. You won’t find any posh wallpaper or perfectly painted skirting boards with this style. The more unfinished and visible the better. LEATHER – Finishing touches should include leather in worn browns or tans. This warms up the whole look which can be quite stark until you bring in the soft furnishings. REPURPOSED ITEMS OF FURNITURE – Anything from the industrial era that can be repurposed or remade into something else is perfect. If it tells a story all the better. This look is all about history and adding depth to the items in your venue. 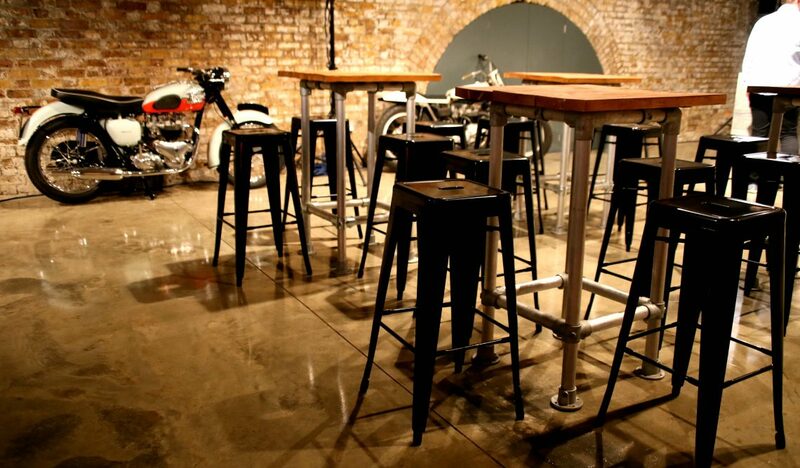 We have some fantastic new industrial chic poseur tables which are made from scaffold poles and reclaimed wood. EXPOSED PIPES – There’s no hiding the pipes away with some skirting or plastic tubing. We want to see these pipes in all their glory. And it not just pipes, anything that makes the building work, from air vents, air con systems, to exposed ductwork. Leave it out and proud! METALLIC WIRE – This is easier than it sounds, think of any accessory you need in your house, such as a rubbish bin or newspaper basket, and use one made of wire. These days you can also get beautiful wire cages for lamps and lights that really add the finishing touches to this look. LARGE ART FOR WALLS – Finally, celebrate the space with enormous artwork on the walls. Think of industrial scenes such as old blueprints or skylines or industrial graphics like cogs or old clocks.